Teaching and Research Interests: feminist thought, Holocaust studies, and interfaith dialogue. Nowak is passionate about helping students discover what they truly believe. "I think I have the best job because I get to work with people from ages 18 to 25 asking questions about who they are and what they really believe. Also, I get to work with them in terms of all of the major issues that are happening right now. I get to deal with people who are really taking the next step in their development as human beings." 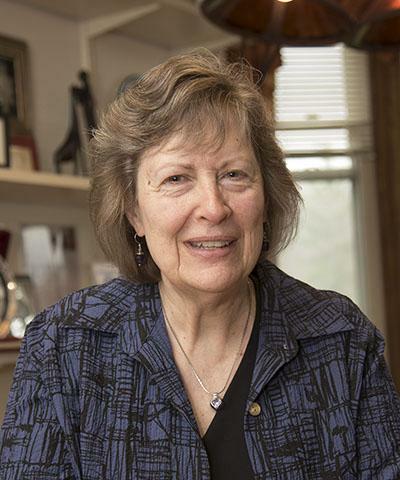 Nowak obtained her bachelor's degree at Naz in 1977 and started teaching here in 1996. As an undergraduate, "Nazareth taught me that I could think, analyze, and discover. It became an incredible adventure for me. The professors I had were supportive and caring, but they pushed. Here, I learned about values, what's important in life, and how to build strong relationships. Going to grad school, I realized Nazareth gave me solid preparation for the advanced study of religion." Nowak became a Sister of St. Joseph shortly after graduating from Naz. She didn't come from a strongly religious family, yet Nowak was impressed by everything the sisters stood for. "When the sisters founded this place, they were going against the grain," says Nowak, "and I admire that kind of passion. That is at the heart of Nazareth College. If I can be that kind of presence in any way, then I'm glad to be here." Nowak attended graduate and doctorate programs at different colleges, but she always dreamt of ending up back at Nazareth. "I wanted to come on board and build the strongest religious studies program I could, that students could run with. Nazareth students are ordinary people with extraordinary abilities who often haven't had a glimpse of that yet. I like being someone who helps them get a glimpse of that." "I had a freshman this semester stop by my door and say 'I had a crisis this week. My whole family is atheist, and now, because of your course, I think I might be a spiritual person. I didn't know what to do about that. I had to talk to my parents.' But she was really afraid that her parents, especially her dad, would be very upset about this. Her dad said, 'I actually understand. And I'm finding myself being drawn towards Buddhism.' The family then had a whole other conversation." "I've had students come up to me and say, 'My parents, my pastor warned me to be careful about this course because you would probably try to change my faith.' And I say to them my hands are off your faith. That's not what my concern is. It's the academic study of religion, a discipline like history and sociology. Even if I didn't have the passionate and personal connection that I do with religion, I believe we need to know about one another. " "The transformation that I'm hoping for is that each student is able to find his or her true self, for the moment, to be authentically and justly who he or she is. I want each student to feel empowered to be the strongest, most compassionate, hopeful, energized person that they can be. I do believe that seed is in each person. If I can do anything to help that blossom and grow, then I can sleep well at night." "I don't care if students go on to study a formal religion. I want them to find that deeper part of themselves that is connected with other people, the environment, and that can carry them through the hardest of times. It's the strongest part of them. I think part of being human is being spiritual. We care. We love. We want justice. We want connection. We want to belong. People want to do good. That's what I want students to discover, that they carry values." In Nowak's Exploring Religion course, "students have to go out to two religious ceremonies of their choice that are not of their own experience. This intimidates students, but at the end of the course, students always tell me not to change that requirement, because that is where they learn the most." Since 2000, Nowak has helped organize The March: Bearing Witness to Hope. Every other year, undergraduate and graduate students travel to Germany and Poland to study the Holocaust. They bring home what they learn and "address issues of prejudice and bigotry at Nazareth, where they work, and in society at large," says Nowak. "I teach Exploring Religion every semester and I never get bored. We have a great religious illiteracy in the United States because many people don't know what they really believe in their own tradition, much less anyone else's. This class is the time for students to ask any and every question they have about religion. I love breaking apart the box that they believe religion needs to stay in." Assisted in development of Holocaust by Bullets, a website created by Naz students documenting the stories of community representatives who have experienced violence due to their religion, gender, and/or race. The project aims to contribute to violence prevention through the sharing of first-hand stories. "Susan created an environment in the classroom that allowed every student, no matter their worldview, to engage in meaningful discussion and self exploration. She taught through example, bringing principles of religious theory and ethics to life by relating them to present day events. It was her class that motivated me to participate in The March: Bearing Witness to Hope, which is among the most profound experiences of my life. Looking back at my time at Naz, it was Susan's classes that helped to shape me as a person and my passion for public service."